We have been remodeling our mobile home kitchen and finally finished in December after a month of weekends working on it. In the coming posts, we’ll detail our project for you from start to finish. We’re happy it’s done, happy it’s no longer something we’re just talking about, and happy that we did it ourselves. In this post, we’ll talk a bit about what was wrong with our old kitchen, and some of the things we did to make it tolerable until we committed to completing this project. So! Our old kitchen- where do I begin? 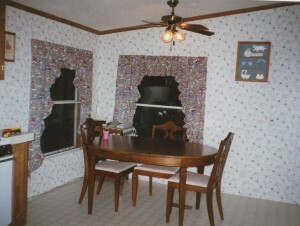 It had your standard double wide flowery vinyl-covered gypsum wall board. It was an exhibit of epic proportions of cheesy cheap cupboards- and tons of them. Double wides are infamous for built in furniture! The only home that a built-in entertainment-center-bookcase-gun rack comes standard in the living room! Our kitchen was no exception. Nearly three walls of cabinets, all of which were sagging dreadfully from 15 years of holding our copious collections of junk. At about the 10 year mark, we decided that we were going to plan our kitchen remodel, but that it was too expensive a prospect to go at it with our full plan just yet. 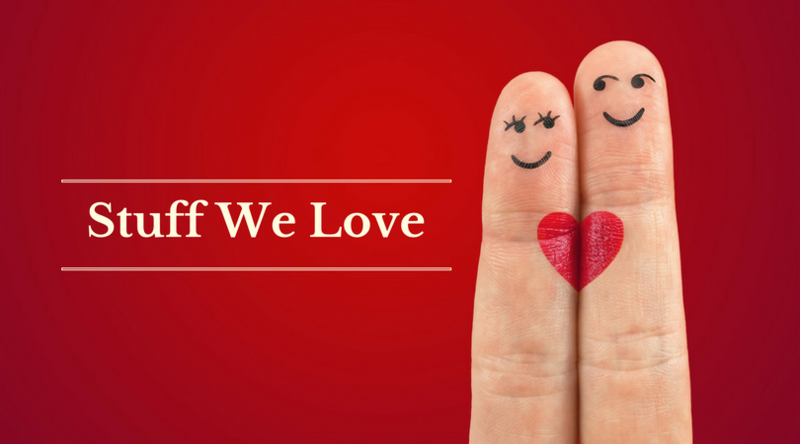 When we do it right, we want new flooring, new walls (resurfaced), new appliances, molding, cabinets, counter-tops. If it’s going to be in the kitchen, it’s going to be new! So, at that point, we did a “patch-job” on the kitchen to get us by until we had time to do it right. Our kitchen cabinets were painted, new snap and lock laminate flooring, new windows and trim (part of a larger whole-home replacement project), and the counter-tops were resurfaced in a cheap, labor intensive, DIY way. This whole project (not including the windows) was less than $800 to complete. We were satisfied with the results and it was enough to get us by without wanting to rip the cupboards off the wall each time we opened them. We did a great patch job on the counter tops that I highly recommend if you don’t have the money to invest in new cupboards and counters. A technique we found on the internet is similar to the method used in this Ginni Granite Paints video. This product wasn’t available that we knew of at the time we did this project. We purchased quarts of paint, beginning with a slate black, and adding a dove grey, and finally a white. We used the dabbing technique with sponges and then coated it with a water based poly coat. You must use water based poly because it is safe for food preparation. We applied 6 coats of poly to the counters with a sanding between each coat. All in all, it took 9 coats of products (paint and poly) and about 8 days of work/kitchen disruption. In the end, I was thrilled with it. Keep in mind, this was 8 years ago, money was tight, and we were so sick of our laminate counter tops that I could have painted them with zebra stripes and thought it was trés chic! I have noticed that Lowe’s now sells kits for this for over $200. I did this with three quarts of paint and a quart of poly, a sea sponge, a paint brush, and steel wool. It is NOT worth over $200 in my book. These counter-tops lasted us for about 7 years and were still in great shape when we tore the old kitchen out. I have no doubt that they would have lasted for many more years. At the left is a rather messy pic of our first kitchen touch up with the cabinets painted white and minty paint and decals on the walls. This picture was taken during the beginnings of our demo of that kitchen in preparation for our major kitchen remodel that we had been planning for for a few years. While at the time of this demolition, I was completely ready to rip every cabinet off the walls (as I was every time I opened one for the year before we tore them out), this touch up lasted us for many years and made us happy until we were prepared to do a thorough remodel. I loathe mobile home cabinets and the cheapo way they throw the plumbing in, allow for open spaces under the cabinets for rodents to get in, and how they crumble with any exposure to water, which is completely idiotic in a kitchen, no? I also have a hate-hate relationship with popcorn ceilings, but that’s another post altogether. I apologize that I don’t have a more inspiring picture of this stage of our kitchen’s life, but the $800 I mentioned as the price for this touch up stage did include the laminate flooring for a 20′ x 15′ area, paint and hardware for the cabinets (not cheap when you have three walls of cabinets! ), and paint and supplies for the counters and walls, and plantation blinds for two giant windows. 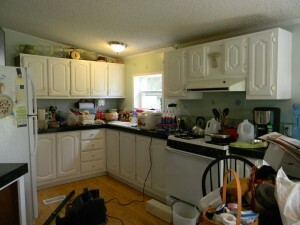 I give you this post to prepare you for the next post about our full kitchen remodel. This is meant to show you that even a little bit can mean a lot when you want to touch up your spaces, and if you just can’t afford the fabulous makeover you would really like, making due by making little changes for a while is a great way to buy yourself some time. There was even a period of time when I put a futon, an area rug, and a coffee table in our dining area because our family NEVER sat at a table to eat and felt more comfortable hanging out in a more casual space. There are no hard fast rules for remodeling. It’s your home. Make it feel good to be there. Redefine your spaces the way YOU want to enjoy them. 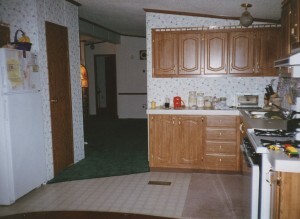 Next time, I’ll share with you our complete mobile home kitchen transformation. It’s a space that I don’t yet call complete as I have not gotten a new refrigerator to match my beautiful stove, and the ceiling hasn’t decided what it wants us to do with it yet, but it is a beautiful space, a space that I LOVE to cook in, and love to share meals with our family in. Hell, I even love to just stand in it and look at how beautiful it is. Most of all, it looks NOTHING like a mobile home kitchen. Hi. We are wanting to do a cheap kitchen remodel. I wanted to do a wood refinisher? Or paint them? They are a cherry wood color which i like. However my problem is the kitchen counter tops. It's really think chipboard maybe? The tiles that go around the sides are falling off. The top laminate sheet on the counter top is peeling off. What can I do? Finish peeling off the top and side tiles. The chip board or wood is a few inches thick. But being a rough surface i don't think i can do a refinishing kit can I? I know on floors there are self leveling paint to make things level and smooth but don't know if that would work. 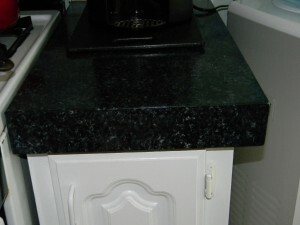 I have saw concrete counter tops that have a finished beautiful look. I don't know if a lite concrete finish on the rough counter top would help? Just needing help finishing the rough counter top. Thank you! Hey Melissa! Thanks so much for visiting our site. 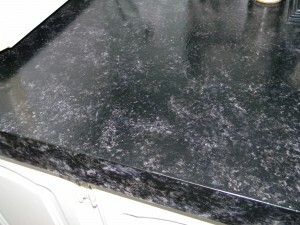 From what I’ve read about countertop refinishing kits, your counter might be the perfect surface to do this on. I love the way these look. If you do this, please visit our facebook page and share pics of your work. I’d love to see this finished product. With doing a remodeling in a mobile home, do you need to buy any special cupboards or flooring or anything like that? We are looking at buying a mobile home for a weekend get away and one that will need work ( we like to do that kind of stuff) but new to the mobile home thing, can you give me any tips? Thank you for sharing your post, your kitchen is beautiful! Thanks for visiting and commenting, Karen. We have always used supplies from regular big box home improvement stores like Lowe's and Home Depot. We have remodeled nearly every single part of our home inside and out and we've only purchased a few things over the years from a mobile home parts store. We have used all regular cabinets, counters, fixtures, lighting, flooring, that you would put in a stick built home. We've never had any issues and have always been pleased, except with one flooring product we used that was just an inferior product due to scratching on the surface. From what I've seen, most of the people who communicate with us here at MyMobileHomeMakeover.com do the same as we do with regard to building materials and fixtures. Good luck with your purchase! I hope you end up with a lovely getaway! It looks like we have the same cabinets as your first kitchen and I am wondering how you painted them? They are particle board with a paper over the top that looks like wood grain and my sweet granddaughter showed me a few months ago how much fun it is to peel the paper off…eek!! This darn paper wants to peel on the edges and I am wondering if I should sand them to get the loose paper off, then prime with an oil base then paint? Also, my biggest question that my hubby and I are wondering about, and it's a biggie…does anyone know if it is possible to build up on these homes? I have this dream of changing the roof line, add a loft and roof that will extend over the deck?? We scuffed up our cupboards when we painted them. We scuffed them a bit and smoothed over where any peeling paper was. Then, we used a primer, then painted. In my experience, Glidden Gripper is the best gripping primer to prepare this kind of glossy surface with before painting. We used regular latex water based paint, NO oil base. Latex over primer sticks very nicely. It's not like it used to be. They are very well formulated to last as also. This process worked very well for us and the cabinets never chipped in the 5 or 6 years we left them that way before tearing them out and putting new ones in. My mother recently used acrylic paint on her cupboards. They are very shiny, but it is amazingly durable. Her cabinets are solid oak (yuck!). She painted over the old oak and they look terrific. She primed them first then used acrylic paint. Good luck on your projects. If you get a better answer than mine about building up, please come back and share or share on our facebook page. We would love to know and our visitors always appreciate when people share their experiences! Hey guys. Love this site! We have a 1990 double wide and just recently started some upgrades. We have put new flooring in 2 of the bedrooms and in process of doing the last one. Sine we are saving up to do a little at a time its a slow process, of course. Next thing we were going to do is a kitchen upgrade but have run into a problem. We were going to go through sears to get it done but they refuse to do it since it is a mobile home, saying in the past, the appliances have actually gone through the floors yikes! We like u HATE the cheap cabinets!! We have all through our home heavy duty furniture and so far have had no problems. So, what would be your advice on where it go from here? When we had laminate wood flooring put down, the installer said we have a stable foundation. Thanks for your advice! Hi Pam. Thank you for visiting our site and for your comment. I'm not sure what you are asking about, cabinets or appliances. We have standard appliances and cabinets that would go in a stick built house and we have no problems. We installed all new stock cupboards from Lowes 8 years ago and they are still like new and haven't fallen through the floor yet. We have plenty of heavy furniture in our home and it isn't an issue. I think Sears just doesn't want to deal with potential liability. So, go to Home Depot and order the appliances you want and have them deliver them and install. If you want new cabinets, they are easy to install as well. You can find tons of videos on how to do it correctly on Youtube if you want to do it yourself. If you don't feel confident enough, find a local contractor who will do it for a reasonable price. The big box hardware stores may even install them for you if you order them there. Plus, if you or your spouse is or was in the military, you get a 10% discount on the cabinets. I'm not sure about the install, but the products you buy you do. Good luck to you. I'd love to see what you end up doing so if you have a chance, please head over to our facebook page and share pics if you'd like! Love your post. I've lived in mobile homes at various points in my life and (other than the occasional North Texas tornado warning that keeps me shaking in my boots) find them to be a comfortable alternative to high priced housing now days. I bought my current mobile mansion used 8 yrs ago. It was only 4 yrs old and they had shined it up with new white paint throughout and carpet. I first did some easy fixes and cosmetic upgrades like changing out the lighting and cabinet hardware. Something I always tell mobile home owners to do. It's easy and you can buy standard contractors packs at the big box stores at a pretty good price. I went with oiled bronze finish lighting and hardware. It really spruced up the place. Then I painted some accent walls to give it a more "home" look. Other than a new water heater and putting in shut offs and replacing most of the faucets it really hasnt needed much more. I also upgraded all the appliances to black 2yrs ago. About a year ago I decided I want to get it ready to retire in. I started in the bathrooms first. Replaced the flooring. Armstrong Allure plank flooring works great right over the old linoleum and the overlapping material makes sure water doesnt get through to the subfloor. It costs a little more but for folks like me with limited DYI expertise it was pretty easy. I painted the vanities a dark espresso paint and replaced the counters with marble vanity tops. Wow what a difference. I just finished redoing the Laundry area. Like most single wides you have to walk through it at some point to get to somewhere else. It was always cluttered and a basic eyesore. I had purchased a front loading washer and dryer with the intention of adding a nice pantry for much needed kitchen storage space. I placed 3/4" plywood right over the linoleum to add some stability to the flooring for the added weight of stacking the machines and painted it white to cover it temporarily until I replace the flooring in the whole kitchen. I found a beautiful used espresso 8ft tall pantry online and drove 1 1/2 hrs to scoop it up for only $90. It took some wiggling to get it in and spent another $40 on some extra trim to make it look built in but man does it look good. I also replaced all the moulding around the doors in the house with regular wood casings and I cant get over how great it looks. It was only about $10 per door when you by the 'door pack' at HD. I like it so much I'm going to start casing all the widows also. My next big project is the Kitchen. I've got real ugly flat front laminated MDF doors and have always hated them. My bro in law (a contractor in another state) showed me how to make them look like solid wood shaker style cabinets by sanding all the way down past the paper and adding 2" lattice moulding all the way around. While I was visiting we did a practice one. It was kind of labor intensive, but shoot, it's either time or money and I've got plenty of one of them. Buying a good sander is going to be well worth the money. Other than the paint, it should only be about $10 a door. He said the trick is sealing the finished product with a good primer before painting. He's gonna order me some "commercial stuff" when I'm ready. I just wanted to say mobile home life is great and I really dont think it's any more work to keep them up than a site built home. Just make sure to use quality products when you make changes and upgrade the cheap stuff whenever you can. Try to keep it to only cosmetic changes because these places are engineered to and built to kinda hold themselves up. That cabinet could be holding up the wall that's holding up the ceiling. The floorplan is something you either have to like or get used to. A can of paint and a day off can change your whole outlook on your home. Thanks for your great comment, Keith! It sounds like you have settled into a lovely home and made it yours. We have wanted to install Armstrong Allure flooring for a long time. It didn't come out until we got all of our flooring replaced. We did use it in my mother-in-law's house in her bathrooms and kitchen and it really came out great. We have chosen a perfect grey wood look Allure flooring for the next home we move into. Can't wait! We plan to move to a warmer climate in the near future and will plan to buy another manufactured home. On one hand, I'd love to buy one that someone has already lovingly remodeled. On the other hand, I'd like to buy an inexpensive older one and make it our own. I'm glad you've found a home you can love and are ready to retire comfortably in your spaces. Good luck to you and I hope your retirement brings you many happy, healthy, relaxing years! Wow. My family and I live in a 1996 small double wide that we're having to fix up thanks to water damage, and just crummy construction. So far I've replaced some 3/8th drywall and insulation then painted one room. Replaced most of the carpet with the luxury vinyl planks, and tile (in bathrooms), and we're about to replace some counters, and sink in kitchen plus more of the vinyl planks in kitchen and living room. I'm seeing this and I want to do more. We live in NM and deal with both heat and cold in turns. With 2 young boys in the house it makes it interesting to do the work lol. My husband and I switch off. I'll work and he'll chase the boys then he'll work and I'll chase the boys. I think I'm going to be looking at more of your ideas for making this place more of a home. Thank you for the ideas, and pics of what you did in yours. 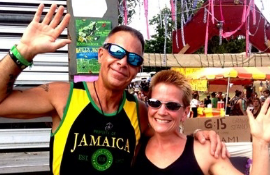 Thanks for visiting and commenting, Suzy! Water damage is just the worst. My mother-in-law had a water heater burst while she was out of state. We had just checked on things a day or so before it happened and found that it happened a day or so later. We don't know really how long water was running into the house. We had to replace the bottoms of the walls in the hall and three rooms, the floor in a walk-in closet, carpeting in three rooms, a complete bathroom remodel and of course, rebuilding the water heater closet. It was a nightmare. It sounds like you've been busy with your place! I know it's a challenge to work on projects when you have kids at home and routines to keep. Pre-planning can really be your friend in this case. The more you can plan and predict before you get started, the more pitfalls you can avoid once you begin working on a project. Good luck to you as you move through your to-do list! I'm glad you've found some inspiration here. I have a mobile home that needs a lot of work done to it. I think I have to take the floors up that's how much work I have to do. is it worth re-doing a mobile home from the frame up or should I just buy another one? Also do you think it can be done under 15,000? Hi Brianne. Thanks for visiting and commenting! 2. Put up high quality linen wallpaper in our bedroom/ put wainscot up, replaced the floor with laminate faux wood, tore out a wall between walk in closet and bedroom, created a whole organizational closet space open to the room. 8. Built a closet in the livingroom out of "found" space we found in the wall. 9. Built all new wood skirting with frames that are buried in the ground so no critters can dig under the house. Now, I will admit, as you can see on this blog, we did all the work ourselves, including the window install. It was a lot, and we were a bit younger and energetic then :-), but it can be done. We were creative about when we would buy materials and used coupons whenever we could for Lowes or HD. I wish you luck with your projects. Just take it a piece at a time. Think everything through beforehand very carefully to determine how you will be inconvenienced throughout the projects and how you will store your supplies and time out your work. We really pushed ourselves and got all of the work listed above done in about 4 months working every weekend. But you could pace out your projects better than that to give yourself some rest in between. If you have questions or need more inspiration, please feel free to come back and let us know! We're happy to share. 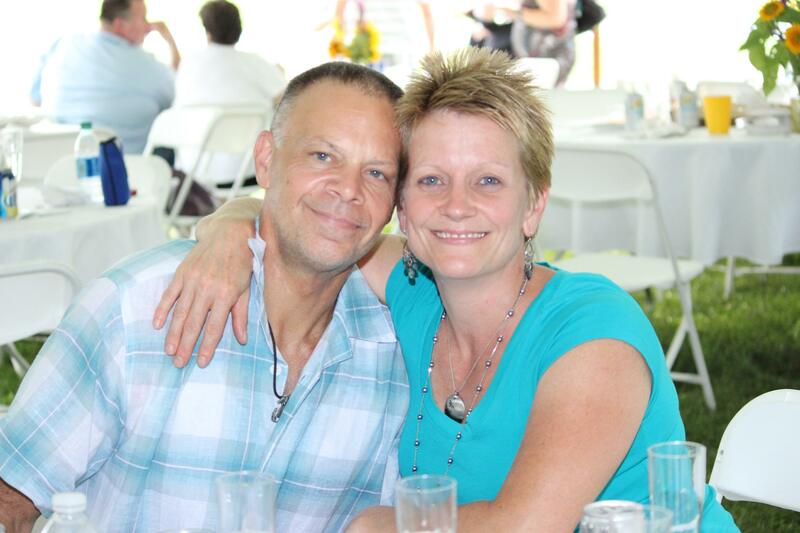 Thank you for sharing your mobile home makeover! I laughed and thought it to be helpful. is this RV or a palace? :-) really awesome. Counter top area is looking very nice. You can go for fridge with black color combination. It will suit with your kitchen or you can go with white one. Both will look perfect with your kitchen. Thank you for commenting. After several years since the kitchen remodel, we still have not purchased a new refrigerator! I would love a black one to match the stove, but I'm pretty frugal so buying one for the sake of buying one is a little hard for me to do when the one we have works so well and is energy efficient. Perhaps someday I will get sick of the mismatched appliances and move forward on getting a black refrigerator. Thank you again for your comment. I love my kitchen! Thanks for the visit, April. If you only knew how many times I've thought about exactly what you suggested. I would love to paint it black. A project for another day. Perhaps with some chalkboard paint? Things have slowed down a pace, maybe I'll get that done soon! Have you painted a refrigerator? Sure thing LJ! We have learned one really important lesson about things in mobile homes…REPLACE THEM with quality products as quickly as possible. Plumbing is a big one because mobile homes are so susceptible to water damage because the materials they are made out of are ruined by water so easily. Wall board, flooring, cabinetry under sinks, etc…they are all made of pretty low quality materials in older homes (pre-2000?) so minimally installing shut off valves under all sinks and in shower fixture plumbing was a big one in our experience. Another great tip I received about keeping cabinetry safe from water damage (especially once we replaced the vanities in the bathroom and the kitchen cabinetry) is to line the bottom interiors of the cabinets with sticky square flooring. Find something you like that looks nice and line the bottoms with it. It will look good, save them from wear and tear of pulling things in and out of them, and will keep water from making contact with the cabinetry. We will be doing some work on our skirting in the late Spring hopefully, so subscribe to our feed or Facebook page to keep up to date on the work we're doing. And as always, if you have any questions, please feel free to contact us. We're happy to share what we know. Good luck with your new home! It's a great thing to reuse a home that is already built and can be made into anything you want…all you need is your imagination! Thank you for this! I purchased a 15 yr old mfg. home in December. I am, however, pretty clueless about many of their idiosyncrasies, like skirting, venting, plumbing and plenty more. I appreciate your pics and links.